"Siri, what's the price of Bitcoin today?" It might not be the cryptocurrency emoji everyone has been asking for, but Apple has rolled not one, but two, dedicated Bitcoin BTC glyphs in the latest version of its mobile operating system, iOS 12. The glyphs are available as part of Apple’s new Shortcuts app (not to be mistaken with the Shortcut menu in settings) which allows Siri to complete complex tasks with simple voice commands. The annoying part is that you will have to set up Siri before you can even browse the glyphs in the Shortcuts app. Another issue is you can’t use glyphs as emoji – so if you were hoping to drop it frivolously in chats, you’re out of luck. True Bitcoiners are probably already wondering: what’s up with the blue, is this glyph for Bitcoin (BTC) or Bitcoin Cash (BCH)? The answer is neither and both: you can adjust the color of glyphs individually. 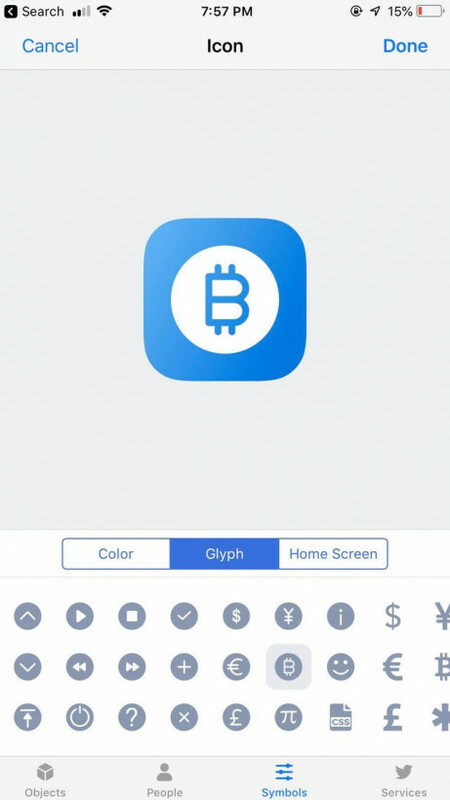 Disregarding this time the Big A updated its developer guidelines to ban cryptocurrency mining apps from iPhones and iPads, the new Bitcoin glyph is the closest thing to a blockchain endorsement the Cupertino giant has ever done (alright, this is a bit hyperbolic). Sarcasm aside, Apple has mostly withdrawn itself from the public cryptocurrency and blockchain debates. But considering the recent trend for corporates to experiment with the new technology, it will be interesting to see what the Apple effect can do for blockchain. One more thing: go flaunt the Bitcoin glyph with pride.